It’s taken many an Isobel nap time to complete, but my latest collection, Little Big Gifts, is up in the shop and ready to go. In this collection I’m featuring small gifts that are inexpensively priced that would make great gifts for the holiday season and perfect stocking stuffers. 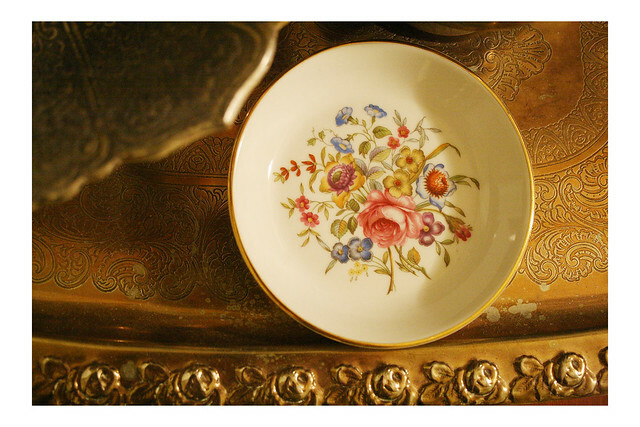 I’m also hoping that the non-celebrating amongst you will also be interested in this collection simply because they are cute pieces that I’ve priced them attractively as well. You’ll notice the glass bubble try in the first photo. 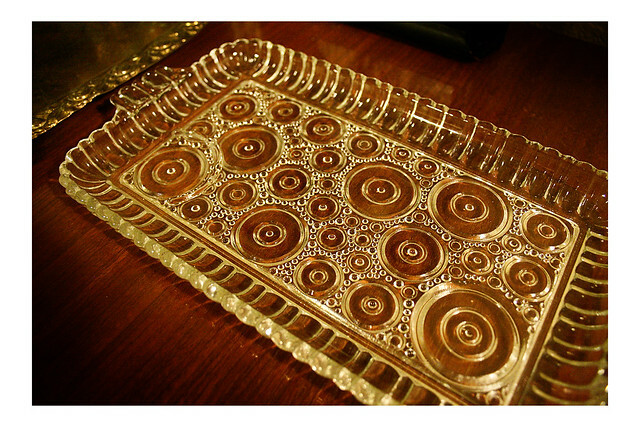 How I love that petite little tray. 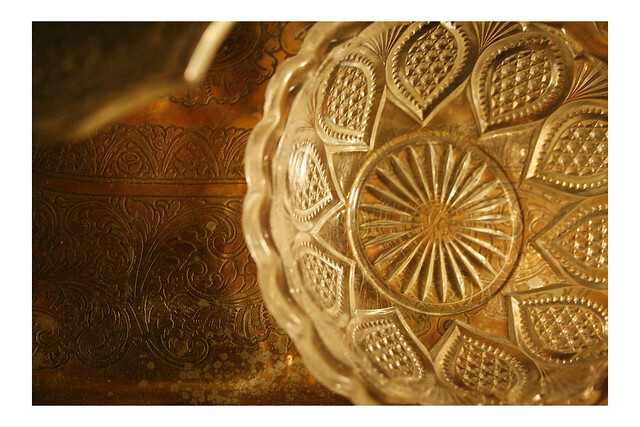 There’s something about the circular pattern that is so wonderfully vintage yet so perfectly suited for a modern home. 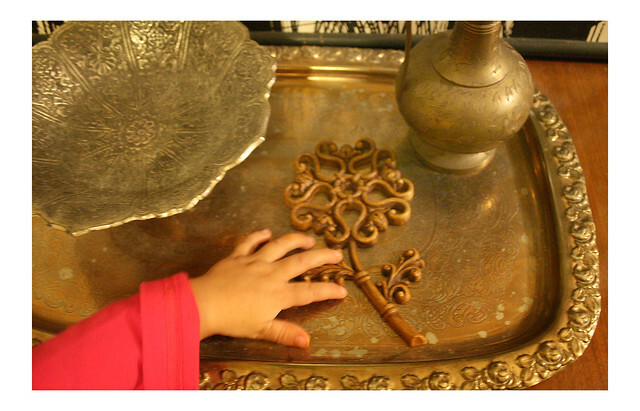 It would be great as a tray to hold outgoing mail or jewelry. 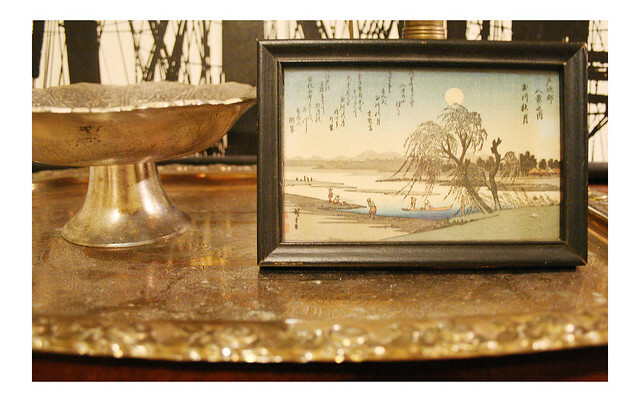 This tiny wooden frame holds a delicate yet perfect scene of Japanese fishermen. 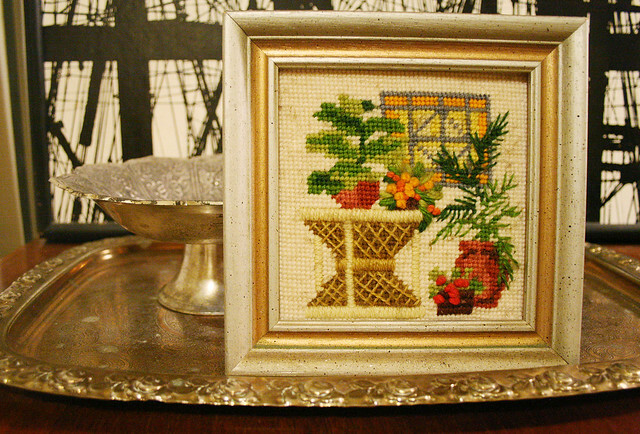 Ever interested in ways to pimp my desk or office, this colorful needlepoint would brighten up any space. The Parthenon. 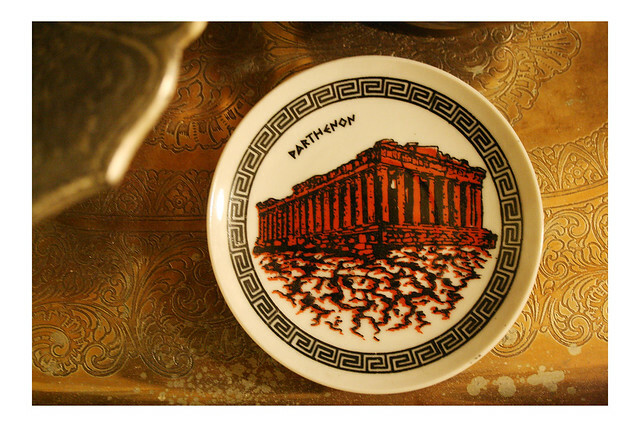 You don’t get more vintage than ancient Greek ruins now, do you? 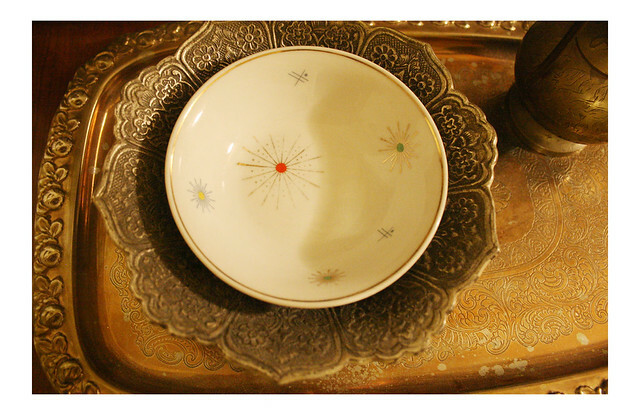 This Mid Century Mod bowl features the rare “Starlight” pattern and was made in Bavaria. As you can see, Isobel really likes this plastic daisy. 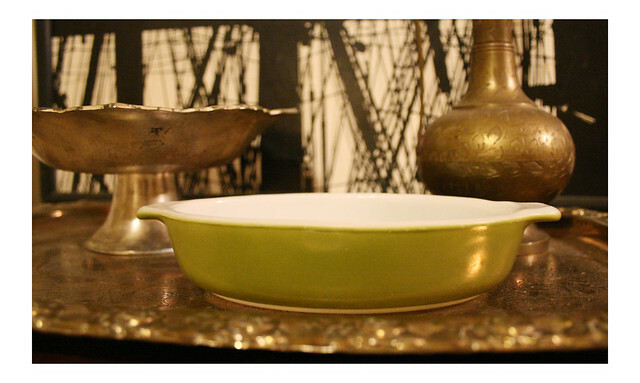 I use bowls like this emerald green and crystal clear one for cat food bowls. Luxurious! 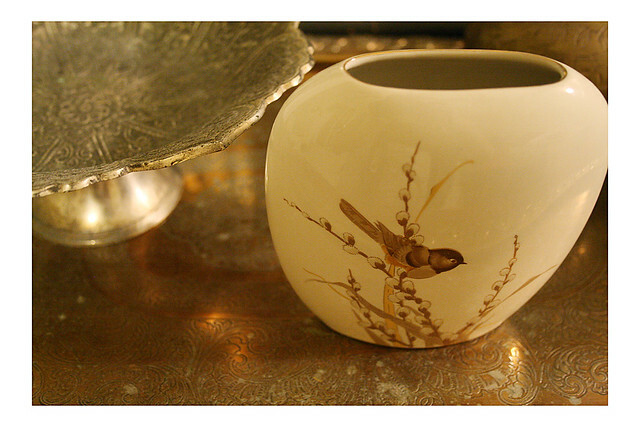 This tiny, Japanese sparrow-vase could also pimp out a desk with vintage class. 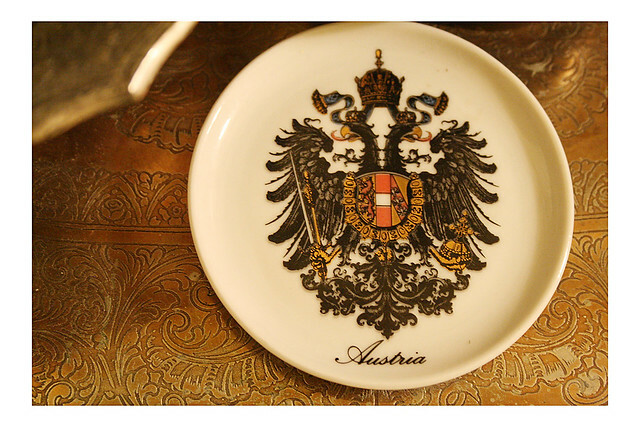 Last but certainly not least, we have the Austrian Heraldic plate. Nothing says “badass” like a two-headed eagle. I have several more items in the shop besides these and I will be adding more as we progress toward the holidays. I hope you check them out. Thank you so much for your support of me and my shop. I really appreciate all the kind words. It keeps me going. Truly. 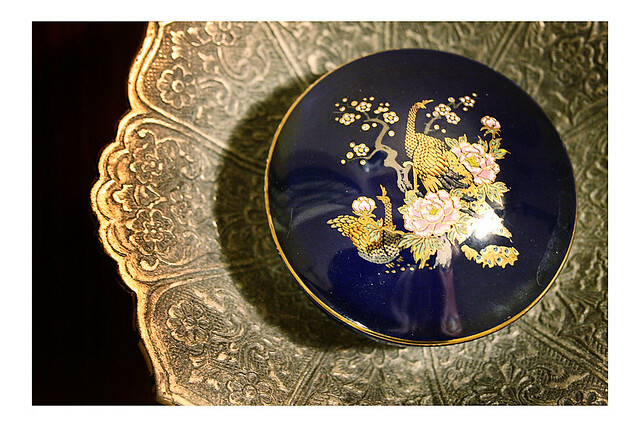 Think handmade or vintage for the holidays this year! 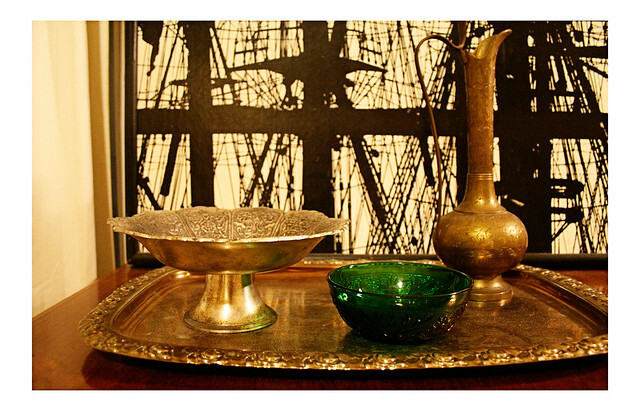 The emerald glass bowl reminds me of the end of ‘Return to Oz’ when Dorothy has to pick out the objects that her friends have been turned into- I’d have to yell “OZ!” everytime I touched it. Yes, I totally know what you were talking about. I loved that movie, but damn, was it ever fucked-up. Remember the Wheelers? Possibly the most terrifying movie creation EVER. I think I’m one of only a handful of people who own it on DVD, and I’ve put friends and dates through the agony of watching it. LOVE IT! I always wanted to try some of the rock king’s food. Also that room with Ozma’s heads? INTENSE.